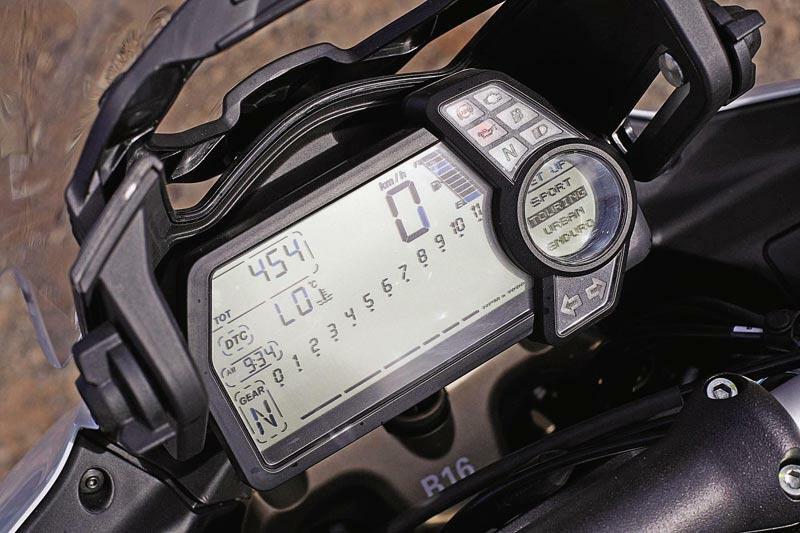 In ‘Sport’ mode, the Ducati Multistrada 1200 handles – truly – like an 1198 superbike (albeit one with a high up riding position and wide bars); in ‘enduro’ mode, it’s tolerable off-road, with everything in between. The Ducati Multistrada’s unique adjustability means anything (almost) is possible. 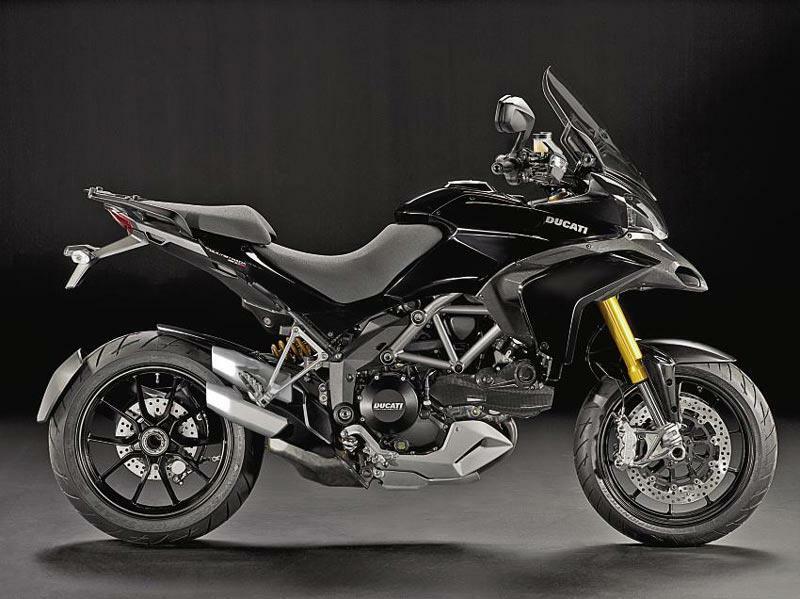 The Ducati Multistrada 1200’s Testastretta 11º motor is based on the 1198 V-twin but with reduced valve overlap for a softer delivery and has a host of mods. Main benefit is smoother delivery, while reduced top end poke (peak power is now 150bhp instead of the 1198S’s 180) is still more than enough to dust rivals. Doubling of valve service intervals to 15,000 miles is a further benefit. 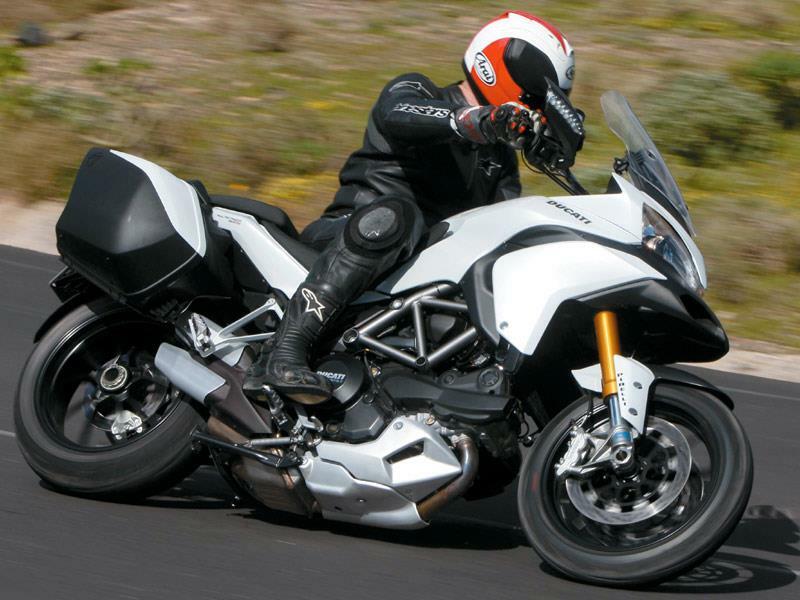 Ducati is getting better all the time and the Multistrada 1200 is the latest proof. Service intervals are now up to and impressive 15,000 miles and generally it’s well built. 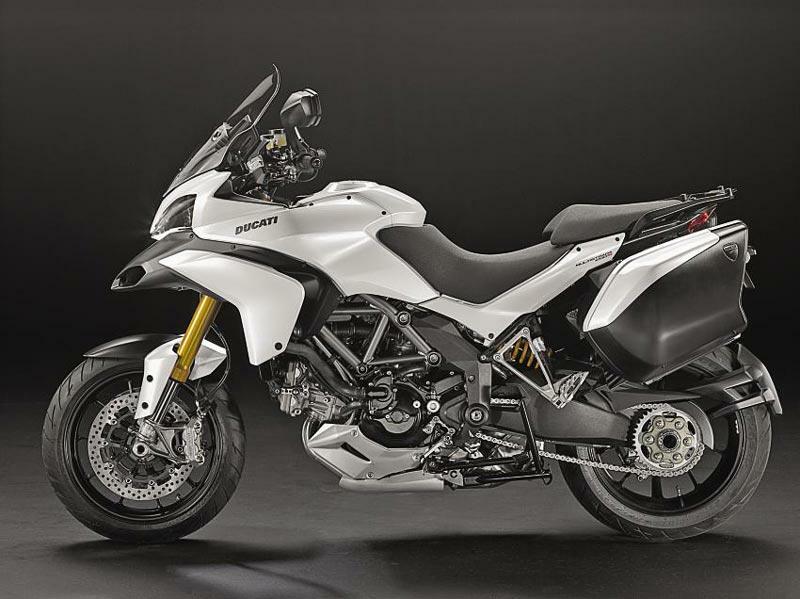 The Touring’s panniers are a touch on the flimsy side and its centre-stand, on the launch bikes at least, was a little crude and touched down too easily. Pricey both new and used but you get an awful lot of world-beating bike. In our view, it’s worth it. But we’re also tempted by the non-electronic suspension and non-ABS base 1200 version, which, when new was a full £3300 cheaper.  Find a Ducati Multistrada 1200S for sale. 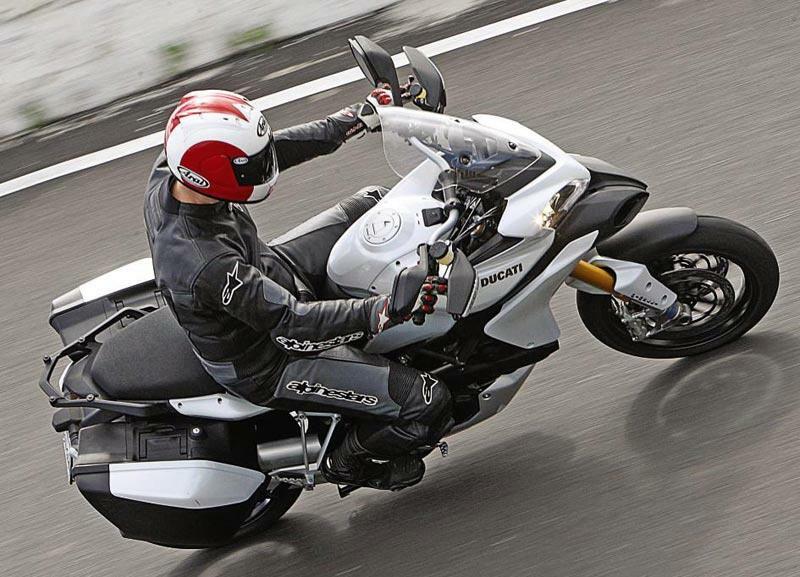 If its abilities weren’t enough to convince you, the Ducati Multistrada 1200’s ancilliaries and equipment are out of this world, too. 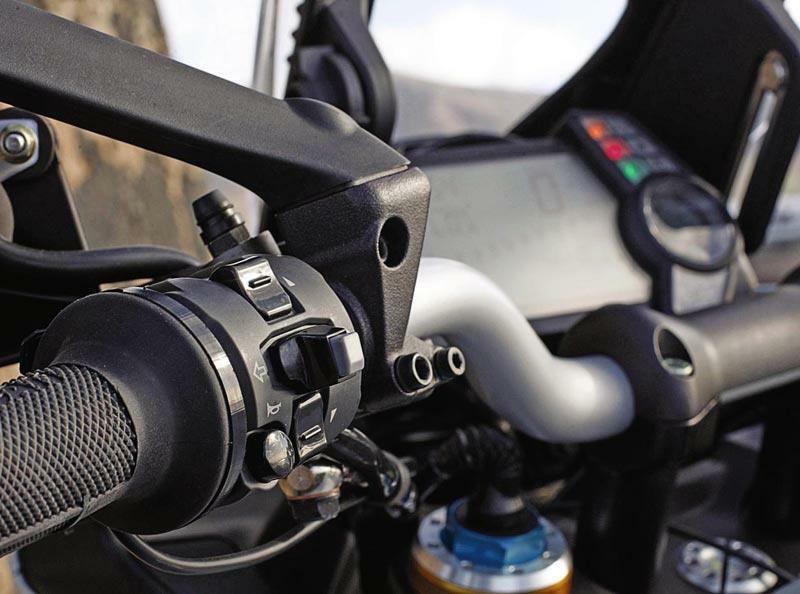 It has it all: traction control, ABS, slipper clutch, adjustable screen, high/low seat options, single-sided swing-arm, fully digitised LCD display console, even, on the Touring model, centre-stand, panniers and heated grips. If you want it, the Multistrada has, almost certainly, got it. 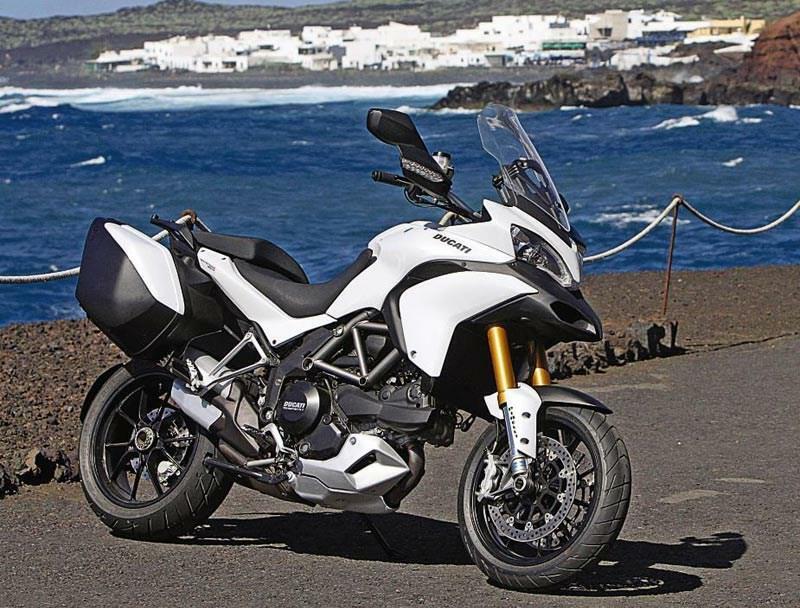 Ducati Multistrada 1200: Base version with conventional 50mm Marzocchi forks and Sachs shock in place of electronically-adjustable Ohlins versions and no ABS, available in red or white only, £10,995. ABS version available for £11,695. 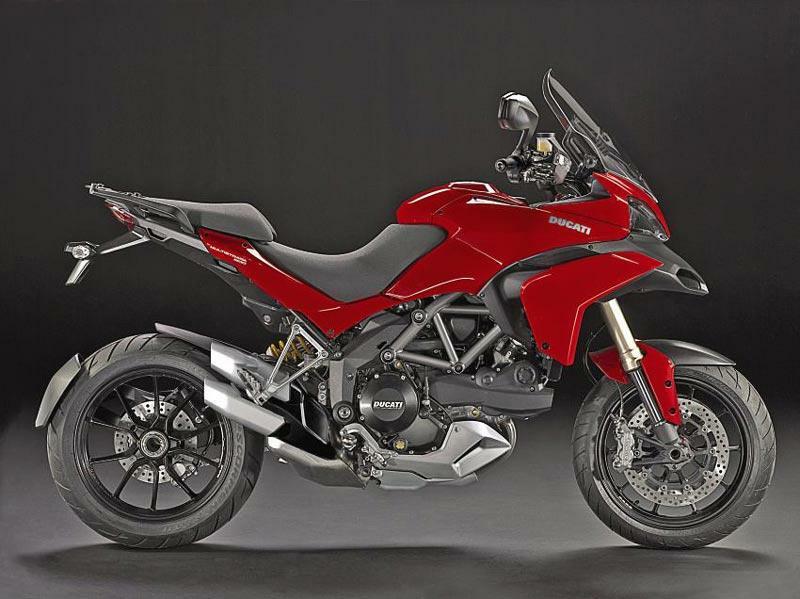 Ducati Multistrada 1200S Sport: With Ohlins DES system, carbon fibre cam belt covers, air intakes and hugger - £14,295. 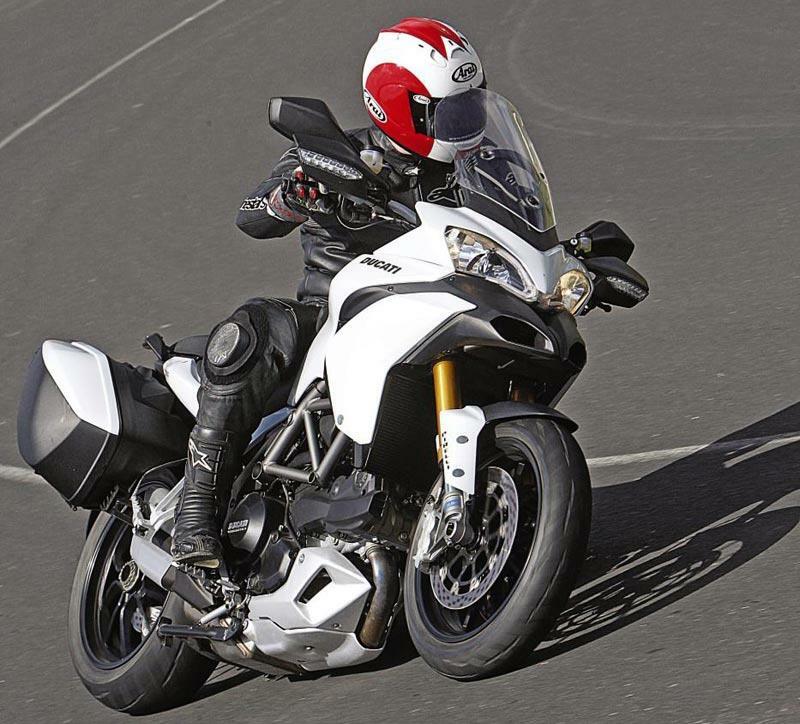 Ducati Multistrada 1200S Touring: With Ohlins DES system, panniers, heated grips and centre-stand -£14,295. 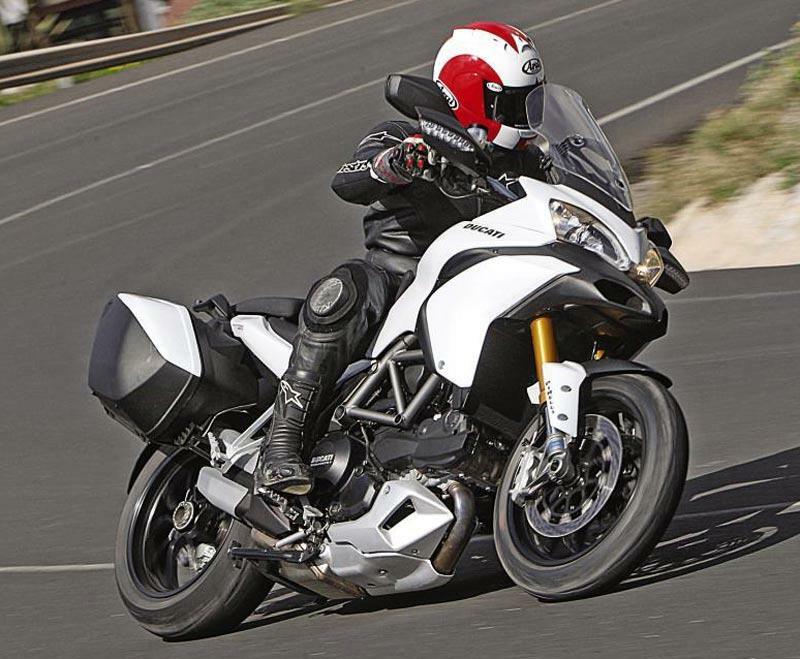 6 owners have reviewed their DUCATI MULTISTRADA 1200S (2010-2014) and rated it in a number of areas. Read what they have to say and what they like and dislike about the bike below. I purchased a four-year-old used Multistrada with 16k miles. Overall, I am extremely happy with the bike. The build quality is very good, the performance is blistering and the dealer support is good. Best features: the ride, the build quality and the long service interval. Riding modes and suspension modes are a great feature. Worst feature: a little snatchy when pulling away. At speed, the bike is sublime, it can do a bit of everything (well) and stop quickly. Low speed handling is good, but I am very aware of the height of the bike. It can be a little snatchy at low speeds, but I am unsure as to the cause of this (chain, fuelling, something else), the internet has too many opinions. I was always sceptical of ABS until I had to use it anger. My wife and I can go over 150 miles, before needing a break. It's brilliant, especially in sport mode. There is more than enough power, but it never feels like it's going to break free from your control. The V-twin is brilliant and much more engaging than an inline 4. My Honda Blackbird had the same peak power, but was much 'steadier' and not as engaging. Overall, I am very happy with the bike, my only quibbles would be surface corrosion on the brake banjos and under the seat. Otherwise, the plastics, electronics, seat, and anodised parts are all 'as new' after four years. I have only given it 4/5 because the fuel gauge float had to be replaced (free of charge) and the remote key got damp which caused temporary issues. I've not had the bike long enough for a service. Apparently the chain and sprockets need to be changed every 10k miles. That's around £350 at the main dealer. The valve service interval is 15k miles and I'm happy with that. I bought the GT version, with the large panniers, top box, engine bars and spot lights. For two-up touring, it's a good choice. The only item I have added to the bike is the Ducati SatNav for touring. I can't think of any other additions the bike needs. I also have the Termignoni silencer which adds a nice rasp in Sport mode. I purchased it from Ducati Ashford, a pleasant and easy experience, with everyone doing what they said they would do and no nasty surprises. In October 2018, I paid £9500 for a 2014 1200S GT, with FDSH and a one year Ducati warranty. 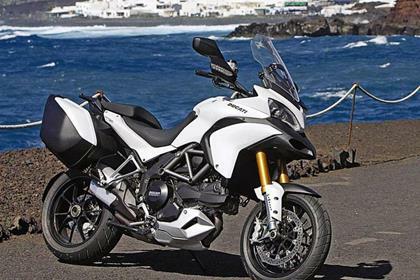 It is quit obvious from the review above thet tis person has not had a go on the Multi S. H own both a Triumph Tiger and a Multistrada S. The difference is as follows the Multistrada has a better enging a better riding position better brakes better handling better wind protection etc. I use the Tiger for comuting and the Multi for fun, so all I can say is get one out on a test rid and see what all of the fuss is about! This is a dream bike for the U.S. in that multi mode riding is a unrealized dream. The four modes are innovative and will be copied by the Jap Bikes soon. As an engineer I give Ducati an A+ for innovation. While I don't own one yet, if I can scrounge the cash, I'll run to New Orleans or Houston and pick one up. My only reservation is the lack of a nearby dealer and the unknown ability of the Harley mechanics to work on a Ducati in Acadian. With the nortiously very bad roads in Louisiana, the various modes seem ideal with Enduro for back roads, urban for in town around Lafayette and the other two modes for the Interstate Highways here. Without Louisiana State Police interference and their Cajun Catchers, trying the top speed is a real possibility between Opelousas and Alexandria, Louisiana on Interstate I-49. £14k+ for a 'bike that won't get you from A to B any quicker,comfier or economically than a 1050 Tiger which is almost half the price.OK so it has lots of electronic toys ,but lets be honest here ,who is it that constantly adjusts their suspension settings,etc? Buy a Tiger (or a Sprint ST 1050) and gaffer tape a Playstation onto the bars...that'll give you something to play with.As for off-road ability...just how many GS's do you think have ever had their tyres in the grass...except at the camp site.You would have to be mad to be doing ANY off-roading on a £14K 'bike...unless of course your name is Potter and you get to use it as a freebie......then it makes splendid sense!